The goal was to spend less for a whole system than what people spend on a popular GPU alone, so I win. The video card arrived, but I ran into a snag I didn't anticipate. The cover of the Dell has a large internal handle, which bumps into the 6-pin power cable for the video card and won't let it close (the large pic of the cover is from somebody else who encountered the same problem, but the attached picture with the arrow is mine). 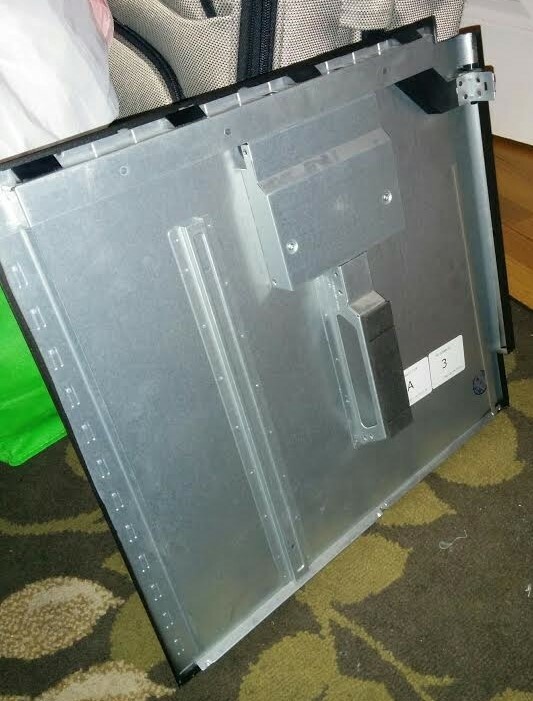 The rectangular-ish thing above the handle can be screwed off, but the handle itself appears to be welded on, so I'm not sure how to remove it without damaging the cover. For initial testing purposes I had installed an old AMD card that didn't need auxiliary power, so it didn't have this problem. I'll probably end up having to get another model of the 1060 which has the power connector in a different position that doesn't interfere with the handle. Last edited by Incredible Hulctuary; 11-25-2018 at 11:16 PM..
Not the prettiest solution, but can't you just dremel off the handle? And/or do they make angle connectors? And/or replace the case instead of the graphics card? I don't have a dremel or experience with one. But I have some hacksaw experience and I might buy one. I discovered that the black rubber surface of the handle actually touches the video card when the case is closed, so there is no room for any kind of connector at that spot. Apparently it's designed to stabilize the video card during shipment. Replacing a video card is much easier than replacing the whole case. A card like this is easy to sell on eBay, and I can probably sell it for the same amount I paid (I bought it used on eBay). And I really like this case, except for this oddity with the cover. I'm gonna keep the card and get a hacksaw. If I were to sell this card and buy a different GTX 1060 on eBay, I could have a net loss greater than the $20 cost of a hacksaw (although there's a small possibility of a profit). And there's the time involved with selling and shipping the card and waiting for the replacement to arrive, plus the risk of not knowing whether the replacement will work. A good dremel is definitely more than $20, so if it's just a math exercise, that's the right call. But, dremels are so cool. Dammit. The metal is way too tough for the hacksaw, at least for somebody with my limited hacksawing experience. So, back on eBay it will go. I'm considering going up to a GTX 1070, now that I see them emerging on eBay in the sub-$250 range. But the sellers aren't including pictures with the clarity and camera angle I want for seeing exactly where the power connector is. I couldn't find a replacement GTX 1060 or 1070 card on eBay that met my criteria for price, seller reputation, and visible location of the power connector. So my decision went back to sawing off the handle. It turns out the problem was with my crappy technique. I watched some Youtube videos to get a better understanding of how it's done and what NOT to do, and picked up the cover to try it again. 10 minutes and some sweat later, the obstructive piece of the handle was off. I'll cover up the jagged edges with duct tape. Who woulda thunk hacksawing would be a required skill for installing a video card. This is a really interesting thread, looking forward to seeing the final results. After I installed the video card and SATA drives over a week ago, and closed the case cover without that handle bumping into anything, I haven't done anything more with it. But this weekend I definitely plan to get back to it, starting with installing Windows 10. Then I want to run a few 3D games* with built-in benchmarks to see how this system stacks up against others with the same games. *only games where the benchmark can be downloaded and run without buying the game. At this point I don't know which games meet that condition, so feel free to name some if you know some. Last edited by Incredible Hulctuary; 12-13-2018 at 07:14 PM..